When I was in the second grade, there was an outbreak of lice. Now, bear in mind, this was Hawaii so 99.9% of the students had dark hair. Most had straight, jet-black hair. You could see the little white eggs clinging to everyone's heads as little black specks bounced back and forth. It made my skin crawl. And, eventually, my scalp. I remember the walk of shame in the pharmacy as my mother procured a bottle of foul, tar-like shampoo and a fine-toothed bamboo comb. There was a horrible, caustic smell and slight sting as we literally poisoned the nasty ukus. The smell didn't go away as my hair dried and we tried to comb out all of the now-deceased nits. The smell seemed to fill our whole house. My hair was dry and coarse and stinky. I felt like I was marked. Of course, everyone had the same problem, but you try to explain that to a little girl. I felt like I had done something to deserve this infestation. And, worse, I felt like everyone could tell! 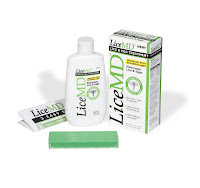 Now that my 4-year-old daughter is in school, I was glad to discover LiceMD®, a non-toxic, odorless, hypoallergenic treatment for the removal of lice, eggs and nits. Thankfully, we haven't had to deal with any preschool pandemics yet but it's good to have options! LiceMD® is a far cry from the nasty stuff we used in the seventies. It's actually good for the hair because its primary ingredient is dimethicone, a commonly used lubricant and conditioning agent that allows tangle-free combing to aid in the removal process. I hope I'll never have to use the LiceMD® sample I received, but I'm definitely happy to know that it exists! *Uku is the Hawaiian word for flea and is commonly used to refer to lice. At least, it was when I was a kid! This is the 2nd post about lice I read today! Is it a foreshadowing of an outbreak to come?! Here's the other post about a children's book on lice. I think you'd appreciate it! Thank goodness my girls have escaped the ukus - so far!